I love traditional triangular shawls, but sometimes they are difficult to keep in place without a pin. I have been experimenting with different shapes that could be simply tied like a scarf or have longer ends that would drape gracefully around the shoulders. Annis’ distinctive crescent shape lends itself to numerous ways of tying and draping, making it a versatile accessory. The shawlette is knitted in one piece starting at the outside edge of the lace and the narrow curved shape is created by a unique set of short rows. 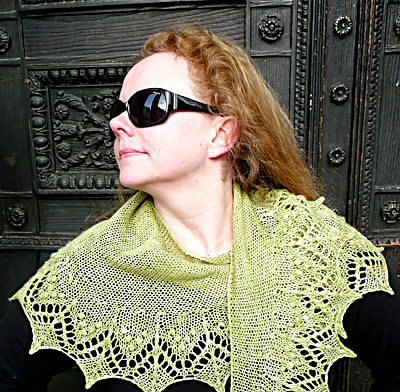 The interesting combination of lace and simple stockinette stitches makes Annis a fun and fast project. Note: Measurements taken after blocking. Nupp: Each nupp is formed over 2 rows. On RS row: Into same st, [k1, yo] 3 times, k1. 1 st increased to 7 sts. On WS row: P 7 sts together. 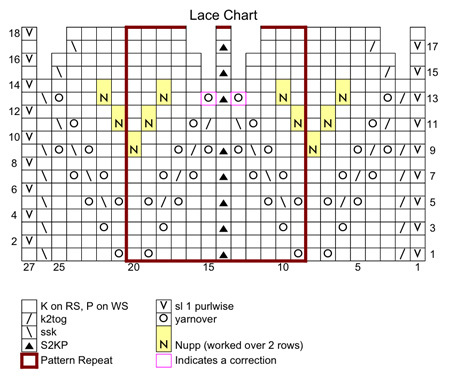 7 sts decreased to 1 st.
S2KP: Slip next 2 sts together, knitwise, as if to work a k2tog. Knit next st, then pass both slipped sts together over st just knit. This forms a centered double decrease. 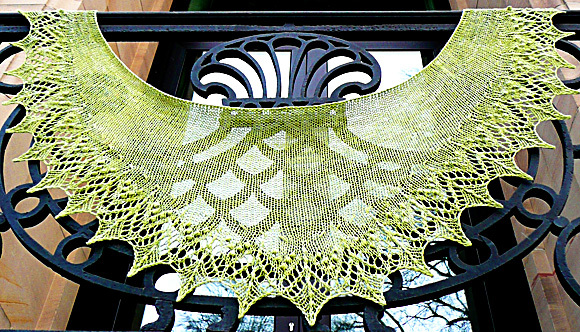 Information about blocking lace can be found here and here. Using larger needle, loosely CO 363 sts. 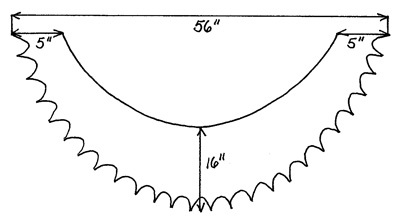 Note that larger needle is used only for casting on, to ensure a loose CO edge. Using smaller needle, work Rows 1-18 of Lace Chart; outlined pattern repeat will be worked 29 times in each row. When all rows of chart are complete, 243 sts remain. Note: In directions that follow, “turning point” refers to point at which previous short row was turned. Row 1 [RS]: Sl 1, k125. Turn work. Row 2 [WS]: P9. Turn work. Row 3 [RS]: K8, ssk, k3. Turn work. Row 4 [WS]: P11, p2tog, p3. Turn work. Row 5 [RS]: K to 1 st before last turning point, ssk, k3. Turn work. Row 6 [WS]: P to 1 st before last turning point, p2tog, p3. Repeat Rows 5-6 27 times more. 185 sts; 1 st remains unworked at each edge. Next Row [RS]: K to last 2 sts, k2tog. BO Row [WS]: [P2tog, sl st from right needle back to left needle] until all sts have been bound off. Block piece to measurements given, pinning points at ends of long edge first, pinning center point next, then pinning remaining points. Allow to dry completely before removing pins. 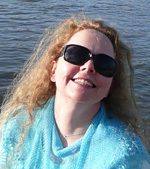 Susanna IC currently lives in Germany with her husband, two sons, eleven fish and countless balls of yarn. 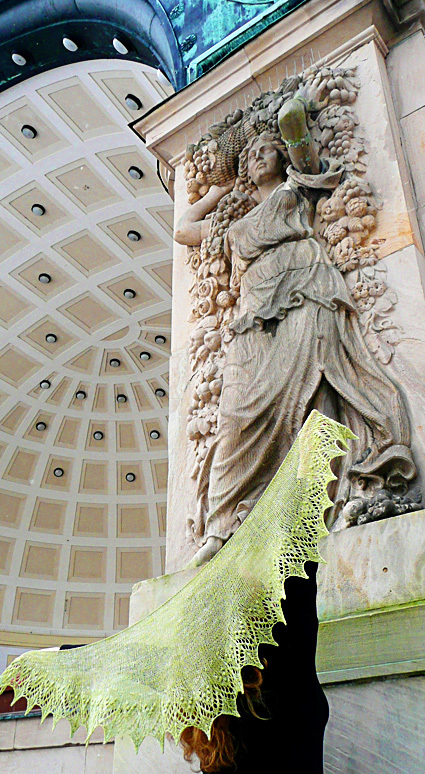 She has an extensive background in studio arts and art history, which inspires much of her knitting. Her projects and designs can be found on Ravelry, user name zuzusus, and at ArtQualia.com.